Premonition and precognition are associated with the mysteries of the sixth sense. However, in budo, it is the five senses – sight, hearing, touch, smell and taste – that are the basis of our martial subconscious. Although I may not be able to predict this week’s winning lottery numbers, I do know that retreating out of range will likely prompt my adversary to move forward. Instinct is innate, but we can cultivate intuition by engaging in realistic exercises regularly. Observing an opponent’s range – punches, kicks, elbows, knees, head butts and clinches are close-quarter strikes and we must remain mindful of even minute changes in distance. Assessing non-verbal cues – excessive blinking, a tense jaw, rapid breathing and tightened fists can signal an assault. Evaluating an attacker’s field of advantage – are they blocking an exit, forcing you into a corner, or limiting your vision, particularly if there are other assailants. Determining whether your opponent is armed or unarmed – is he/she putting their hands behind their back or reaching into a pocket or under a shirt. An already dangerous situation can quickly escalate if an attacker has a concealed weapon. Yawarakai kamaete – even under pressure, project a relaxed, controlled attitude. Kokyu – breathe slowly, deeply and clear your mind to slow down time. Mushin – set your mind on autopilot and trust your combative skills. The same approach can help us create an arsenal against non-physical threats. In the final analysis, is instinct more important than intuition for self-protection? In my view, both are required to survive. 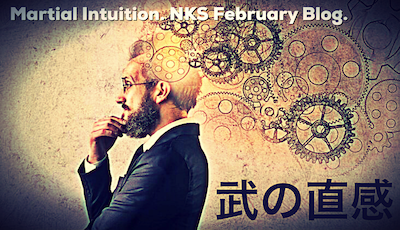 We need to tune-in to our instinctive inner-voice while developing Bu no Chokan, martial intuition.